Comfort food done right: Healthy snacks for winter. Brrr! Did you feel that cold snap as much as we did? Winter weather—nothing makes us reach for comfort food faster. Many of us struggle to maintain a fresh, healthy diet when the chilly months make themselves known. We've already spoken about indoor and outdoor winter activities, as well as remedies for the colds that may come, but how can you keep your health in top form during a time when we're so tempted to overindulge? We've come up with some satisfying, hearty snack ideas to keep you on track each day. Remember, health is about the right food, not restricting food; fill your diet with a range of seasonal, unprocessed foods. Its the key to a thriving body! While this deliciously warming snack is great on its own, it's even better to team with porridge in the morning! If you’re time poor, prepare it in advance and just re-heat in the microwave. 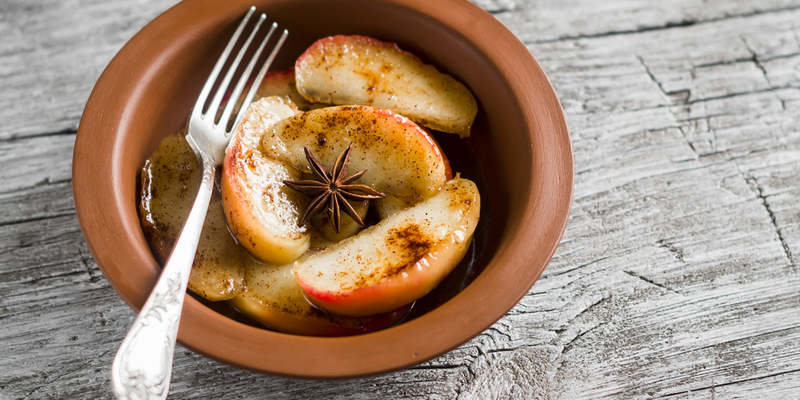 Preheat your oven to 180º C, and then halve the apples through the middle—removing each core with a small spoon. Place the apple halves into a deep baking dish. Mix the brown sugar, cinnamon and nutmeg in a small bowl. Spoon the spice mix into the centre of the apple halves. Pour water into the baking dish, and then place in the oven for 45 minutes, until apples are soft and tender. A couple of times throughout the baking process baste the apples with the water to prevent them from drying out. With only a little bit of fat and sugar, these yummy biscuits will help to satisfy those sweet cravings when they hit, without undoing all your hard work. Preheat oven to 180º C, and line a large baking tray with baking paper. Combine the butter, brown sugar, honey, egg and water with a mixer. Sift the flour, salt and baking soda into a separate bowl, and then stir through the oats. Combine the dry mix with the wet mix. Place heaped teaspoons of biscuit mix onto a baking tray. Bake for 15 minutes, and cool the biscuits on a wire rack once they're done. This veggie chip recipe is super flexible. You can switch it up with different vegetables, if your family prefers, or you can sprinkle them with spice for an extra hit of flavour. Be adventurous! Cut your chosen vegetable into very thin strips, using a mandolin or a sharp knife. Line a baking tray with baking paper or aluminium foil, and then lay the strips flat onto the sheet. Drizzle the chips with olive oil, and sprinkle them with salt. Bake your vegetable chips in the oven for 5 to 12 minutes (approximately 5 minutes for beetroot, 12 minutes for thicker vegetables like sweet potato, carrot and parsnip), turning over only once during baking time. How do you change up your snacking routine in winter? Do you have any quick and clever ways to warm up your regular snacks once the cool season arrives?